Welcome to the first random website review on Magnet4Blogging Media. Every now and then I’ll publish an in-depth review of a website that I’ve stumbled upon on the web. For each website I find to review, I’ll be writing about and sharing with you the good, the bad, and the absolute ugly. The purpose of these website reviews is to help you with your own website. If you already have a website that serves your business that you want to make the most of, hopefully, you’ll pick up plenty of tips, tricks, and ideas just by reading my detailed website reviews here. If you know of a particular website you’d like me to check out and review, send me an email and select “website review” in the drop down menu of our contact page. The website can even be one of your own. OK, let’s begin reviewing the first website here on Magnet4Blogging. So in this month’s firing line peeps, we have PeterWardHomes.co.uk. I stumbled upon this website via a LinkedIn share, and after navigating around the site for 10 minutes or so, I realized that this site would be perfect to review first. So here’s what we’re going to be looking at in more detail. Front-page design, layout, message, etc. Google page speed performance and score. What’s good about the website? What’s bad about the website? Right, so by the looks of things this is a website designed to help home buyers buy or sell their homes. 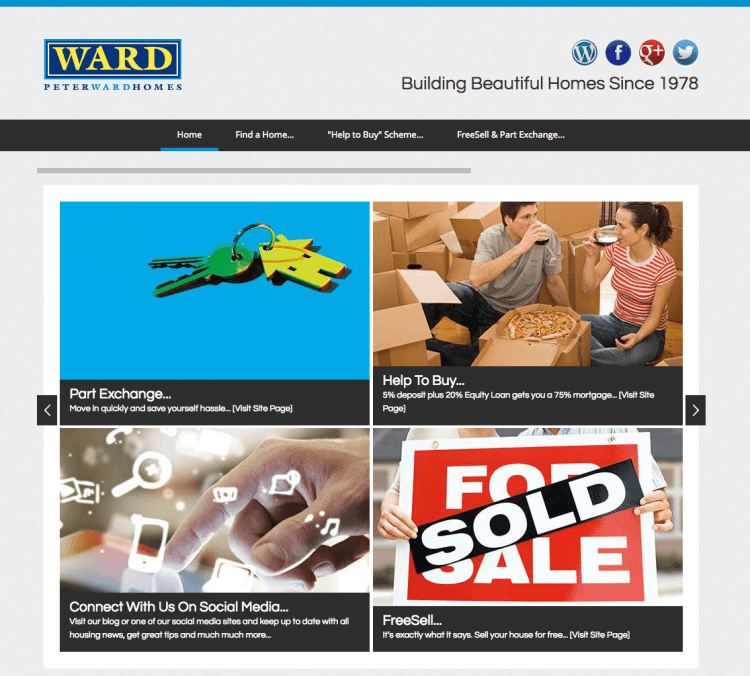 Here’s a screenshot of the homepage of PeterWardHomes.co.uk. The first positive point about this website is that it uses a relevant keyword in its domain name. And, the site name is the same as the domain name. You might think that’s an obvious right thing to do, however, many businesses make the mistake of purchasing and using a domain name that’s not completely aligned with their business, or, one that doesn’t have the same name as their business name. So domain name and keyword is spot on. So now let’s look at the design and layout. The first thing that popped into my mind about this website’s appearance was how dated it looked overall. “Building beautiful homes since 1978”. That message would be better placed over a relevant background image in the form of a hero banner, instead of the header section. Instead, the site uses an annoying, and ineffective, content slider that contains images that are not 100% aligned with what this website is supposed to be about. From a user standpoint, I really think the site design has failed to make better use of the space ‘above the fold’. And, you know my thoughts on content sliders, right? Homepage content sliders do nothing to improve user experience on a website. Most people ignore them since no one really has the time or patience to wait for the next slider to appear so that they can see what it’s actually about. And that’s not just my own opinion, check out this interesting article over on Thrive Themes about content sliders in general. PeterWardHomes.com uses some visuals and images in the content slider, however, this is supposed to be a ‘property’ or ‘homes for sale’ website, right? Yet I feel that some of the images could be more aligned with what the website or business is supposed to be about, which is buying and selling homes. There are images of churches, flower beds, random people eating food, and some other low-quality stock photography on the homepage. There’s actually little in the way of quality images of beautiful homes for sale on the front page. To me, that would be more important and relevant to use than pictures of flower beds. I think the use of images that reflect comfort living, idyllic locations and whatever else is slightly over done here. That combined with the lack of relevant images of actual homes for sale, makes the message less clear about what this website is supposed to be about. So as I scroll down the page and to the footer section of the website, I’m’ greeted with what can only be described as ‘information overload’. The footer area for starters has way too many links, which is probably affecting this website’s conversion rates. So my thoughts at this stage are that this website could be improved a lot, not just from a design standpoint, but also from a marketing and conversions point of view too. How could the front page of PeterWardHomes.co.uk be improved? Content slider removed and replaced with a more “relevant” hero image/banner section. Create a more powerful headline message. Something that incorporates intellectual, empathetic, and spiritual words to help improve the Emotional Marketing Value of the message (EMV). Use more interesting and ‘relevant’ visuals and images of actual homes for sale. Better blog integration. 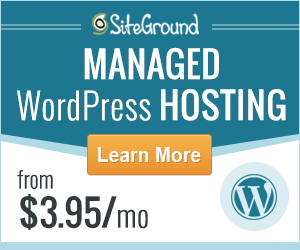 It would appear that the blog is external from the site, hosted on a WordPress.com domain. 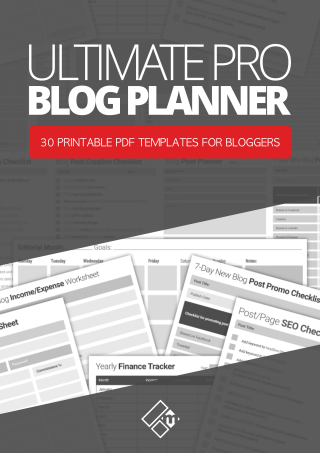 I realize that this is a different matter altogether, however, having the blog on the same URL would benefit this website in terms of SEO and traffic. Better structured “about” and “information” section with clear CTA buttons or links to learn more. Dedicated pages should be created for ‘about’ and ‘info’. 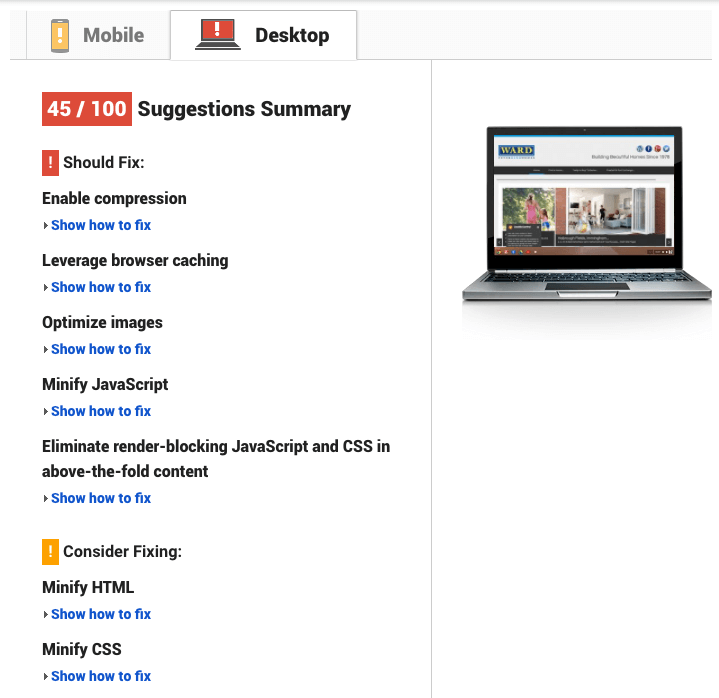 This would also help improve the website’s SEO score. Better organized content in the footer area. Currently, there’s too much information here, and way too many links and options. An example of a better designed and organized website, similar to PeterWardsHomes? 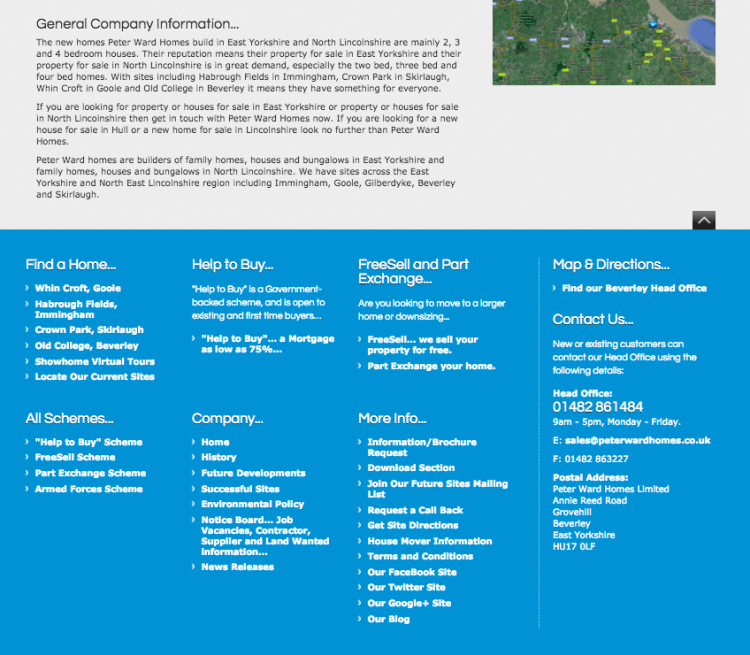 Here’s a screenshot of a similar website to PeterWardHomes.co.uk that I found called Beal Homes. 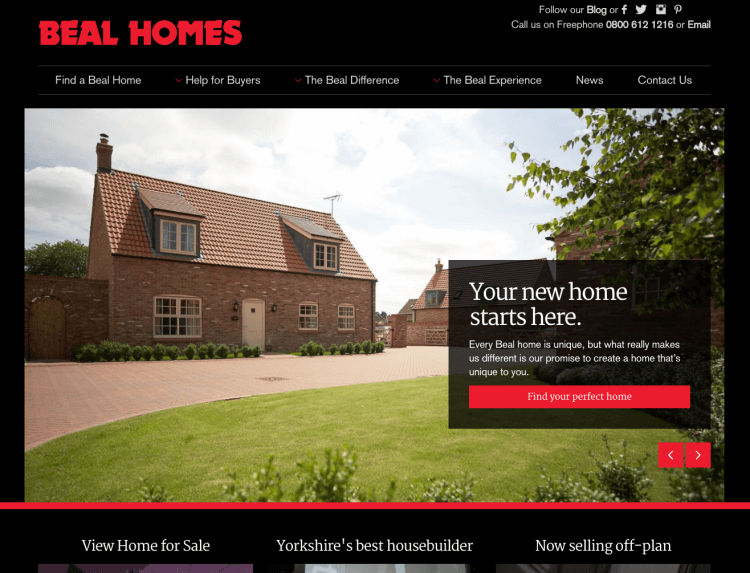 Already you will notice that Beal Homes website makes better use of the space above the fold by using high-quality and relevant images of homes for sale. Although this website also uses an annoying content slider, however, it is making better use of the slider without overwhelming with too much content or options. The slider sections also take the user on a journey, starting with “Your new home starts here” followed by a clear CTA button. So let’s now take a look at the other elements that make up the design and user interface of PeterWardHomes.co.uk. There are clear signs that this website hasn’t been updated for a long while. I am just guessing, of course. Let’s start with those dated looking icons at the top of the front-page. Those could do with being completely revamped by a graphic designer, and, would be better placed in the footer section and not in the header section. If the aim is to keep visitors engaged for longer on a website, why would you add links or icons above the fold that take visitors away from the site? From a conversion stand point, this makes no sense. The main navigation menu seems fine, and personally, I wouldn’t make many changes to this area. 12px, in my opinion, is far too small to cater for all audiences. Modern website designs now incorporate font sizes of at least 16px and upwards. How could the design and UI be improved? Better layout of its content with more space in between elements. Increased font size, as well as increase line height to make for improved readability. Social icons, and any other outbound links placed in the footer section to improve visitor time spent on site. The website is somewhat mobile responsive, however, some of the content is annoyingly difficult to view on mobile devices, and there seem to be some navigational issues too. See screenshot below. 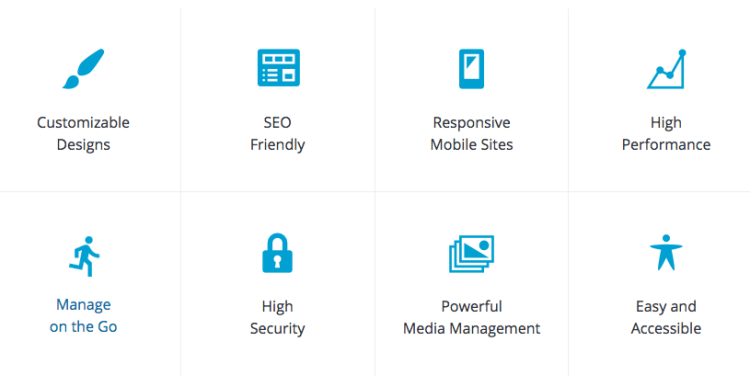 Ensuring your website is clean and fully mobile responsive is critical for any business large or small. 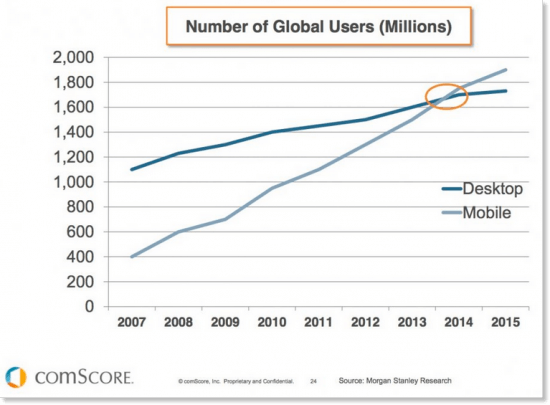 According to this case study report, the number of global internet users on mobile devices has now overtaken desktop users. How could this website be improved on mobile devices? There appear to be two versions of this website, one for mobile viewing and one the desktop viewing. My advice to this website owner would be to have mobile responsiveness built into the desktop site so that when the site is being viewed on mobile devices, the code is easily translated to make the website responsive. Navigation should also be improved on the site for mobile devices. 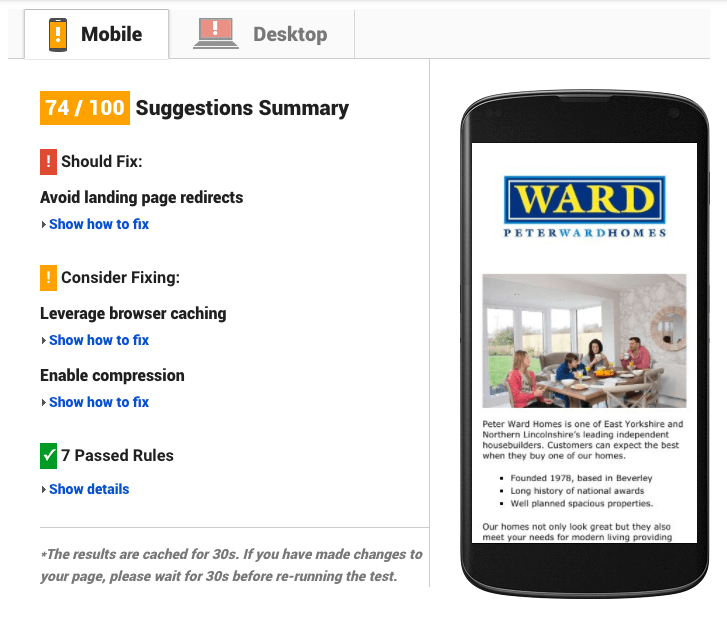 Here are some of the screen captures for the page speed performance of this website. How could this website’s page speed be improved? Enable compression or completely remove the content slider and replace it with a hero/banner image. Here’s a screenshot of the social popularity score for this website. How could social media shares be improved on this site? Installation and configuration of social sharing tools like Social Warfare or Sumo Share. However, since the website is NOT built on a WordPress platform, this would mean manually embedding social sharing tools into the site with some limitations for social media optimization. #6. What’s good about this website design? That’s a tough question for me to answer, personally. Being a web designer and developer, the website designs I’ve created for my own clients have been bold, clean, modern, and fresh looking, with a special focus on user experience and conversion optimization. 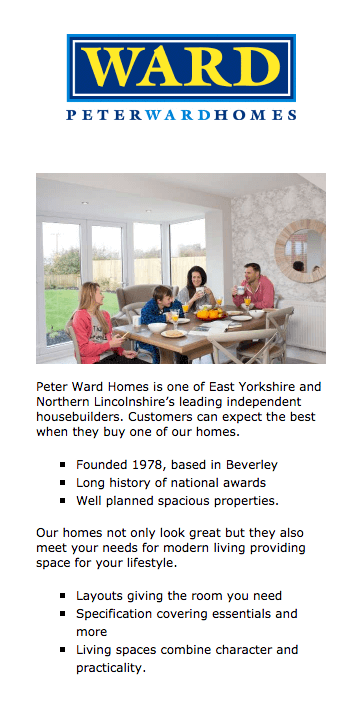 Whilst PeterWardHomes.co.uk has a strong brand identity, the overall design, look and feel, even the usability of the website is pretty boring, and once again, extremely dated. #7. What’s bad about this website design? In all honesty? Everything from that annoying content slider, the small typography, the badly organized front page and content, the content overloaded footer section, and the lack of and poor use of quality and relevant images and visual content. That being said, it’s not the worst website on the planet, I don’t think. The issues are more with user experience than anything else. #8. How could this website be improved? The good news is that any website can be improved, regardless of what platform it’s been built or designed on. If this website owner was to approach me, my first piece of advice to him would be to redevelop the website on a self-hosted WordPress.org platform. 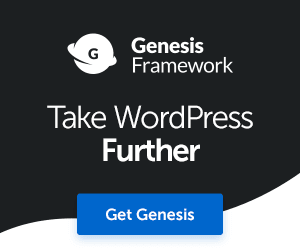 WordPress has a lot of powerful features built into its open source software, as well as built-in mobile responsive, HTML5 markups, performance, security and more. Using WordPress would also make it easier for the site owner to manage and maintain the website himself, saving on management and maintenance time and costs. My second advice would be to make the front page more aligned with the business, create a more powerful and compelling headline title and use better visuals of actual homes for sale. All of this would help create a stronger message to the site’s target audience, improve accessibility, usability and maybe even create more leads and prospects. Trends change all the time in website design. If you have a similar website in this type of industry, or in any other industry for that matter, don’t let it become a dinosaur if it’s an integral part of your business. Keep up with the trends. Keep it updated. It doesn’t matter how large or successful your business might be offline or where ever else, your website is the main online portal for customers to find you and your business, make it special for them. Would you like us to review your website? Click here to let us know. 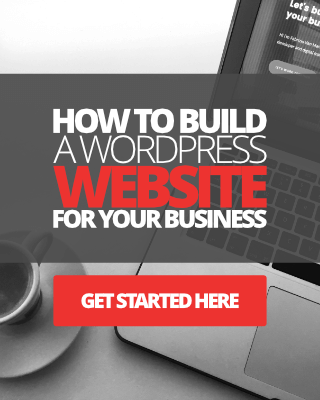 If you need a professional custom WordPress website built for your business, check out this page here.